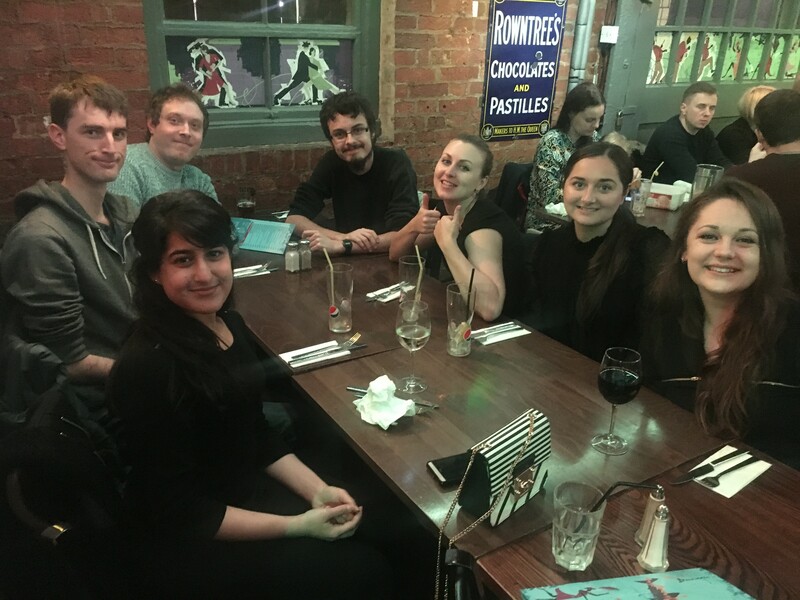 QSF Handover Meal was held at Mambo Jambo Norwich as a thanks to the leaving committee for all their hard work and welcoming the new committee members. The highlights included Nachos, Enchiladas and flowing conversation. 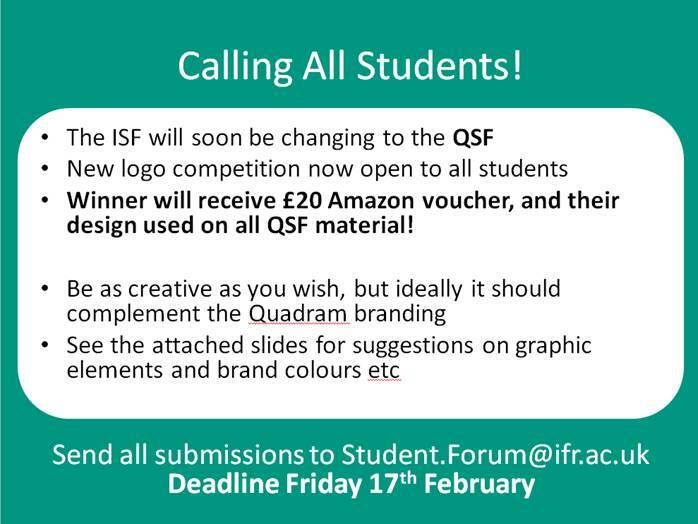 Announcing an opportunity to unleash your inner artist and design the new Student Forum logo! Here at the IFR, the student forum realizes that internationalism is an important part of each students’ personal and professional development. 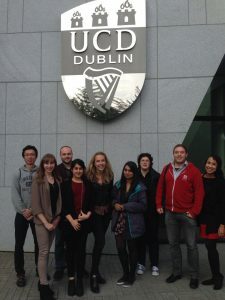 For this reason the ISF funds a yearly student knowledge exchange during which students are given the opportunity to present their work at an international location; this year, that location was Dublin, Ireland. IFR students visited University College Dublin as part of the Student Knowledge Exchange. 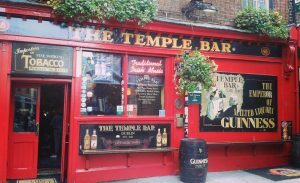 The exchange ran over the course of two full days and was split between three of Ireland’s most renowned academic establishments; Trinity College Dublin, University College Dublin, and the pub. On the first day, students were welcomed by Professor of Translational Immunology, Padraic Fallon of Trinity College. Professor Fallon introduced the students to all the members of his team, including the parasitic helminth larvae which are the focus of much of his work – it’s safe to say no-one got too close! On the second day, the students visited University College Dublin where they met with Professor of nutrigenomics Helen Roche, Professor of food safety Seamus Fanning, Professor of food science Niamh Harbourne and Professor or metabolomics, Lorraine Brennan. All groups were extremely welcoming, with presentations delivered from their respective PhD students and post-docs over coffee and a catered lunch. “It went really well; it was like a small conference” reports ISF Events Officer and knowledge exchange attendee Britt Blokker, who was principle organiser of the trip. After a long and tiring day of presentations, the students experienced part of the Irish culture first-hand by participating in a ‘Musical Pub Tour’. Over a pint (or two) of Guinness, the students learned about Irish culture from folk artists who taught their audience about the country’s history through traditional Irish music and dance. The knowledge exchange drew to its conclusion and the students returned to Norwich feeling exhausted, but with a non-the –less invigorated enthusiasm for their research and a strengthened sense of student community. The ISF hope that a similar knowledge exchange will be run in 2017. Sunshine and sausages were enjoyed by all as the Great British weather finally pulled through for the ISF summer BBQ! The event got off to a soggy start a heavy rain forced the ISF to postpone in the hope of fairer weather. Hedging their bets against a forecast thunderstorm, the organizers’ risky wager paid off as over 20 IFR staff and students congregated under the shade of a marquee (kindly lent by Dan Lock) by the BBQ overlooking the UEA lake. Bruce Pearson taught the grateful organisers a thing or two about hosting good BBQ! Preparing the food was a joint effort with everyone helping out where they could; this meant that everyone had a chance to show off their BBQ skills and everyone had a chance to socialize. 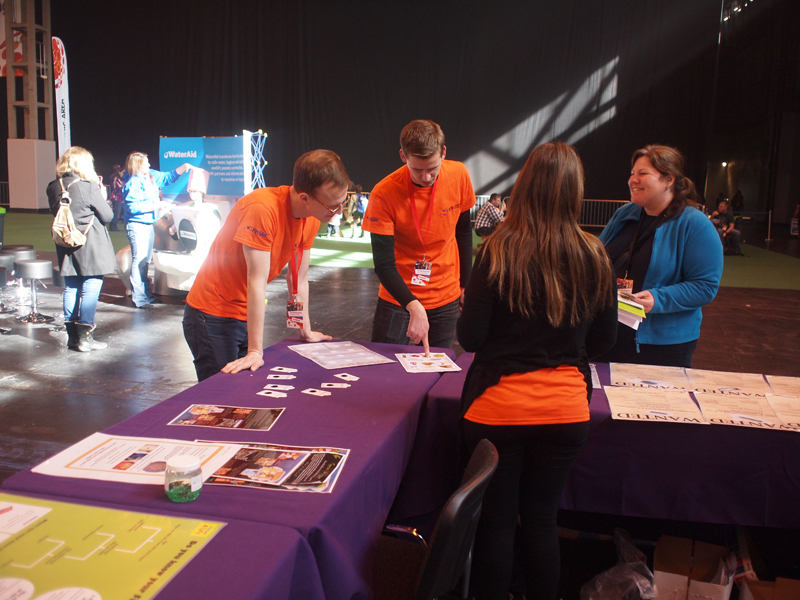 “There was a good mix of staff and students” reports principle organizer and ISF events officer, Britt Blokker “at events like this you get to meet new people that you wouldn’t otherwise get to talk to”. PhD students mingled with post-docs, and some brought their family to join in the fun too. It was Dr Beraza’s son who first embarked upon a daring experiment, investigating that age old research question that many of us here at the IFR have been dying to answer: how much do the ducks of the UEA lake like turkey sausages? (Beraza et al, manuscript in progress). I asked the Beraza group about their recent dietary intervention study, however due to ongoing matters of intellectual property and the potential commercialization of novel food products, their findings can’t be discussed no further. 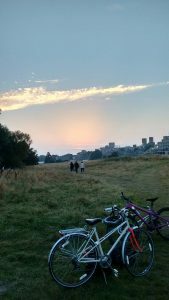 As the sun set over the Ziggurats, the event drew to a close. “It was a great success” Says ISF Chair Sophie Prosolek “We have to thank the UEA PGSU for providing us with funding for the food, but it’s the hard work of the organisers and everyone who joined in who really made the event”. The ISF hopes that next year’s committee will build upon their success and host the event again in 2017; safe in the knowledge that good research is fueled by good friends and good food. When I first heard about I’m a Scientist, Get me out of here! I thought it just sounded like a fun and easy way of engaging in some student outreach whilst never having to leave my desk.. But it turned out to be both challenging and rewarding in equal measure! For those of you who haven’t come across IAS!, it is a 2 week competition partly modelled on TV talent shows and mainly supported by the Wellcome Trust. It is split up into zones of 5 scientists working on a broadly similar theme, who then fight it out answering questions submitted on the website and taking part in live chat sessions with whole classrooms of school children. In the second week a scientist is voted off by the students every day until a champion is decided, who is then rewarded with £500 to spend on further outreach work. 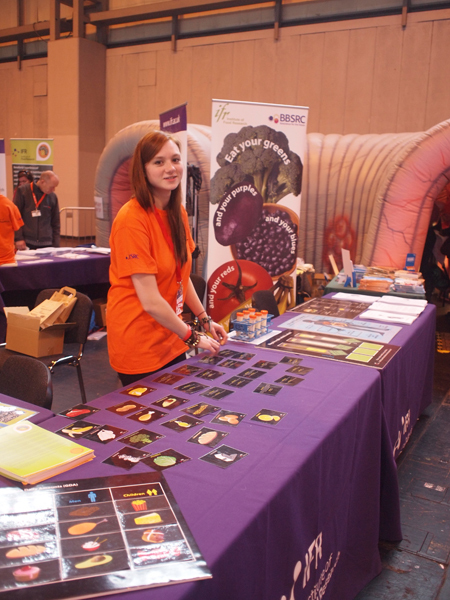 As a lowly first year PhD student I wasn’t sure I’d even be selected, but sure enough I soon found myself assigned to the ‘Sustaining Health’ zone, alongside opponents including an experienced professor and a post-doc at JIC (set up perfectly for a local rivalry!). The first task was setting up a social media style profile page for the students to read about my research. As anyone who has attempted science outreach with children can confirm, it is surprisingly hard to describe your work without using technical language or presumed knowledge.. In the end I just made sure to include lots of interesting pictures of microscopy and impressive equipment (and even some fancy dress from the Christmas party!). As the event started the first few questions started to be posted online, which soon became a steady stream each day. Fortunately most were either easy to answer or interesting to research, although as many of them were asked to the whole zone there was an added incentive to reply first and earn extra brownie points with the students. The real fun started with the live chats however. These had been booked by the teachers in advance, and although I could not do all of them due to lab commitments I still took part in one or two every day over the fortnight. The 30 minute chats were fast and frantic (especially on a few occasions when I was the only scientist available! ), and varied massively depending on how much the teacher and moderators paced the session. Often I found myself typing away faster than I have since my days as a teenager on MSN messenger! I was surprised by how much I could actually answer easily, although I’ll admit that google was my friend when it came to looking up half-remembered facts and figures. What are the disadvantages of the world being flat? Where would you put the carrot in terms of importance for sustaining the growing population? Is your profile picture actually your real face? What does Lizard DNA look like? And that is only a selection of the best I can remember! When I started the competition I was primarily hoping that I simply wouldn’t be the first scientist evicted. So it was a pleasant surprise to survive to the final day, up against a PhD student studying UV-light purification of drinking water. He had developed an ingenious strategy of pre-preparing interesting science facts to produce in any lulls in questions during the live chats (which I of course immediately bemoaned as cheating to the rest of my office but secretly wished I’d come up with first), which seemed to impress the students immensely. So it came as quite a shock to find out at the end of the final day that I had been voted the winner of the zone! It is quite gratifying to find that my science communication skills seemingly appealed to the students, but to be honest the fun was really in the taking part (pardon the cliché). I plan to donate the prize money to some science education charities working in developing countries, as I am sure they will find better uses for it than any scheme I concoct myself. 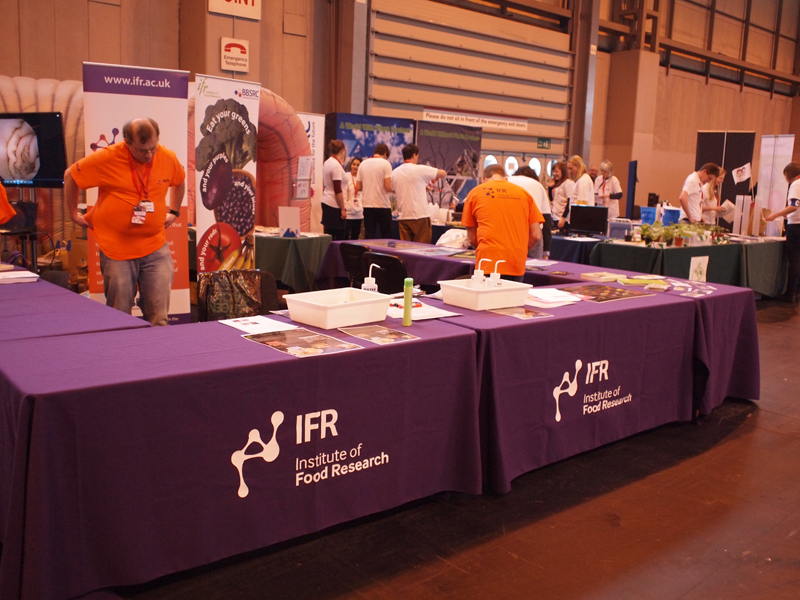 As Duncan Gaskin was victorious in a Food Science zone a few years ago, IFR now has a strong track record in IAS!. I highly recommend anyone who is considering options for interesting communications work to consider giving the competition a shot. It was hectic and challenging but the most fun outreach I have done by far, and I immediately missed it when I returned to my normal work schedule! 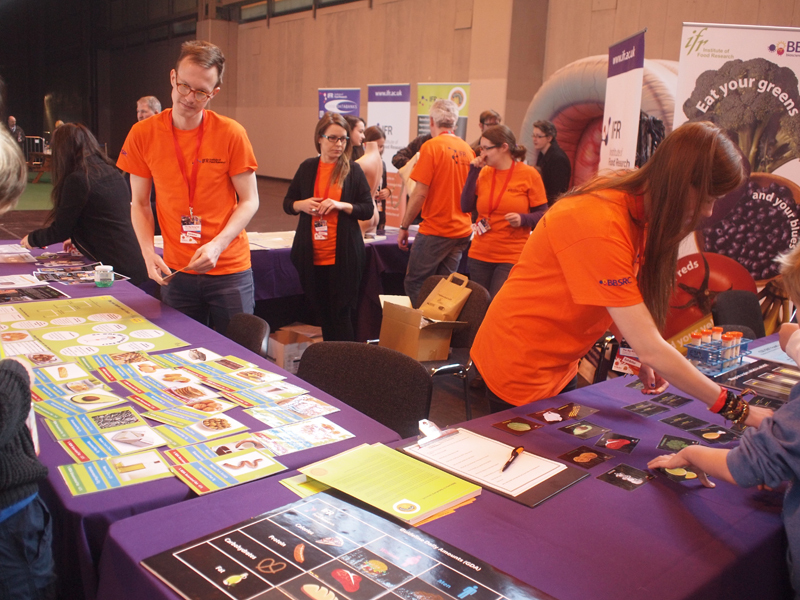 The next I’m a Scientist, Get me out of here event will run from the 15th to 26th June 2015, and applications to take part are already open, with a deadline on the 3rd May. The zones have not been announced yet, but there will almost certainly be at least one relevant to IFR science plus a number of general science zones. Visit http://imascientist.org.uk/ to find out more! By Samuel Ellis, a 1st year PhD student in Stephanie Schuller’s lab. 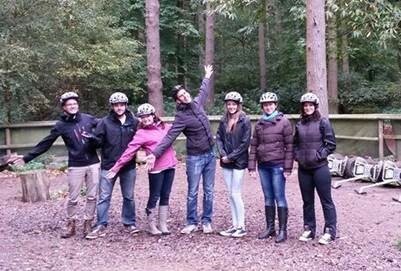 In October 2014, the ISF celebrated a successful first year as a committee, and welcomed our newest PhD students by donning the Segway helmets for the first ever IFR student team-building day. Our first, and unanticipated, team-building exercise was to find our way to ‘The High Lodge’ in Thetford forest, something which our carload were not so successful at, even with a map and the initiative of 4 PhD students. Despite this and the buckets of rain that fell on our journey, our spirits were high as we excitably piled out of the car and headed for base camp. On arrival, we were greeted with a lovely spread of tea, coffee and pastries, which slipped down very well and prepared us for an action packed day. The fun began with the initial (actual) team-building exercise: ‘Would I lie to you’. The aim was to conceal one extravagant, but true fact about yourself with some even more outrageous lies- definitely a useful skill in the world of science! I was quite chuffed with myself when my co-team believed my lie that I once went to clown school! Following the initial ‘get to know you’ session was the main event. We strapped ourselves into the helmets, picked up the Segway’s and tentatively stepped up- this could go one of two ways. Luckily, after the first few baby steps, we were zooming around the practice area. Looking very fetching in our safety gear we headed out into the forest, surrounded by beautiful scenery. Although the route included some hairy off-roading, we managed not to break anyone this time around, and only had one (minor) crash, quite a triumph! After a bite to eat and some much needed warming up, we headed back to base camp where the remainder of the day was filled with some more team-building exercises. Our initiative was really tested when we were asked to build a basket sturdy enough to catch a golf ball using only a few straws and some tape! 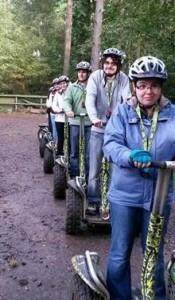 The day was rounded off with an awards ceremony and presentation of our (unofficial) Segway licenses. Mine still stands proud on my desk to this day. After all the excitement, it was time for some sleepy students to return back to actual work…but on a serious note, the day was a great success and enjoyed by all. I think all would agree that it helped to tighten the bond of the student community at IFR. By Elizabeth Thursby, a 3rd year PhD student in Nathalie Juge’s lab. Application open for 22 new PhD studentships at the IFR! Applications are now open for 4 year PhD studentships at the Institute of Food Research to start in October 2015. The PhD studentships, funded through the Norwich Research Park Doctoral Training Partnership, form an integral part of our research that addresses the fundamental relationships between food and health, food and the gut and the sustainability of the food chain in order to further the production of safe, healthy foods. 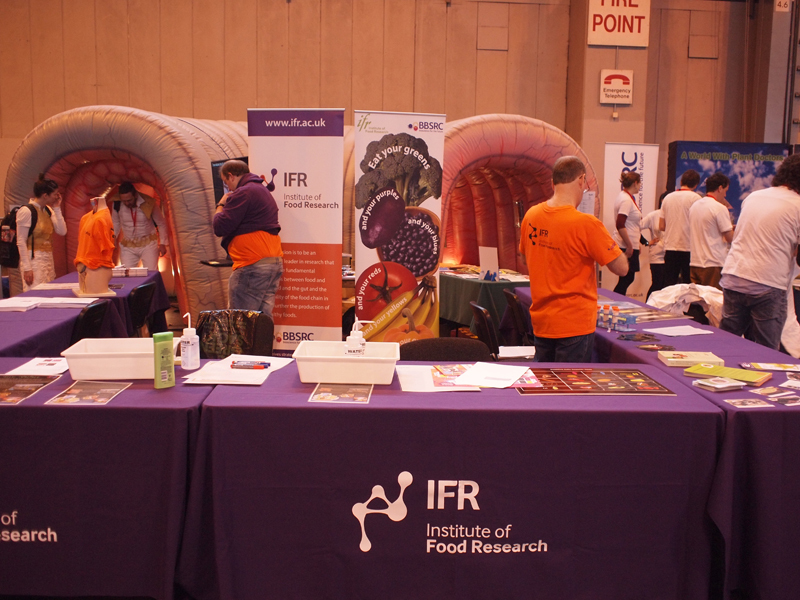 Projects being offered cover the whole range of IFR’s current research, from delivering a better understanding of gut bacteria through finding ways of tackling obesity. There are opportunities that involve tackling foodborne pathogens, making food and diets healthier, improving sustainability in the food chain and understanding what makes a healthy gut. The full list of all advertised studentships and additional information on each can found here. You will become part of a community of over 2,500 scientists working on the Norwich Research Park, a leading centre for research in food, health and the environment. You will be working and studying in a great environment. The Norwich Research Park boasts 230 hectares of open parkland on the outskirts of the city of Norwich. Norwich itself is a vibrant city, with a superb quality of life, great entertainment, a unique mix of ancient and modern architecture, a top 10 UK shopping centre and good links to London and internationally, via the Norwich International Airport. 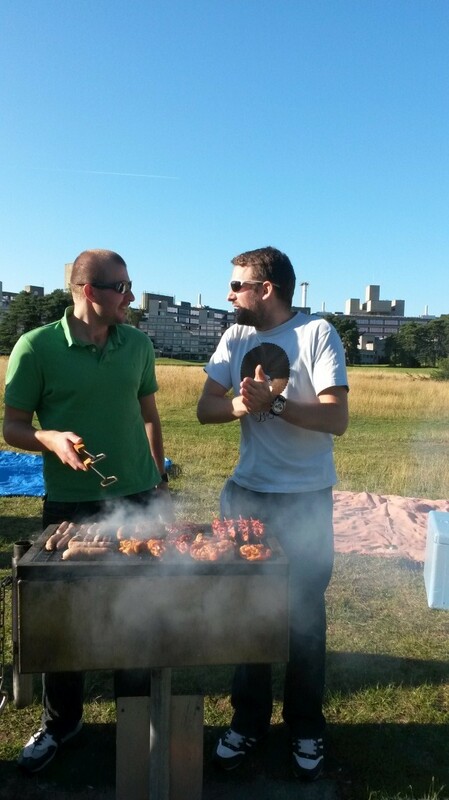 With the recent weather being unlike that majority of the British summer and the tan lines appearing from lunchtimes sat in the sunshine the IFR Student Forum decided it was time for a BBQ, hopefully starting the tradition of an annual summer celebration! So, with a spot at next to the UEA broad booked, a large ice box ready to cool whichever tipple took your fancy, and a tentative look skyward to check the dark clouds weren’t rolling in (luckily as you can see from the photos it was a beautiful evening!) we headed off in the direction of the university. By 6pm a great mix of IFR staff, post-docs and students both new and current were enjoying the sunshine and prodding the flames of the freshly lit BBQ. After having our fill of the delights from the grill the games were begun. The rounders (or ‘pretty much baseball’ as the Canadians among us noted) match was going very successfully until Bruce took a tumble, the result of which was a pretty spectacular break of his collar bone and some scary looking x-rays. Fortunately he’s now on the mend and is already scheduling the re-match. The lessons learned from the day? A BBQ with the IFR staff and students is great fun, and a brilliant way to relax after a hard week of PhDing…..but perhaps we’ll leave the rounders bat at home next time! You’ve seen the poster titles. You’ve felt the nervous tension wafting through the corridors. Yes, the IFR Student Science Showcase is fast approaching! Once again, this event promises to be one of the highlights of the academic calendar at IFR. 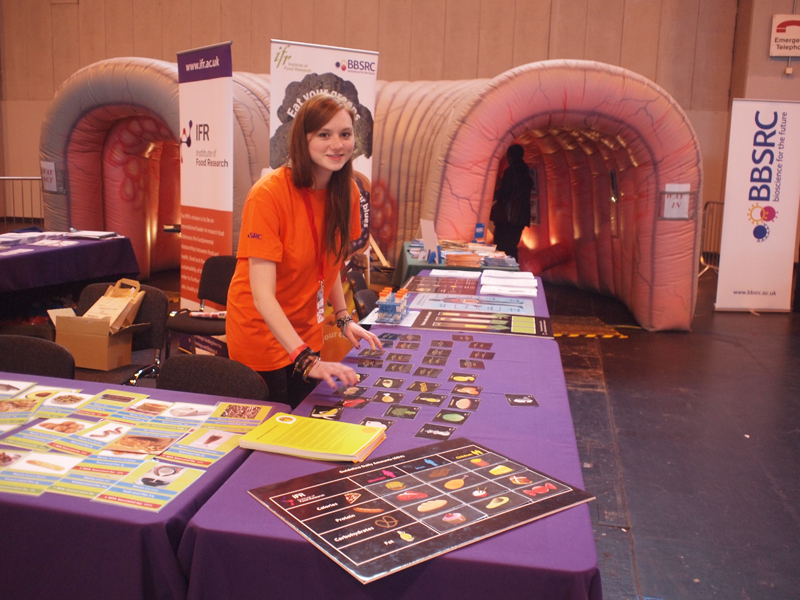 We caught up with Lizzie Thursby – member of the organising committee and previous poster prize-winner – to give us her top tips for the day along with a taster of what we can expect from this year’s event. You took part in the SSS for the first time last year. Did you enjoy it? I thought it was a fun day! It is not often you get the chance to present your work to others and I enjoyed the challenge. There’s usually a hint of competition between you and your colleagues as well, which can be a lot of fun! The IFR SSS was the first time that I presented my work to people outside of my specific field of research, and this made me aware of the challenges that arise when you need to interact with an audience of mixed scientific backgrounds. You quickly realise that not everyone has the same level of understanding of your project as the people in your office, which means that you have to think about your work differently in order to make it sound understandable and also interesting to others. I remember that an older student approached me at last year’s Showcase and said, ‘so, tell me about your poster!’ I was really nervous and my mind just went blank! But the student was really encouraging and I soon felt more comfortable. I learned from this experience that it’s good to prepare a kind of ‘mental script’ that summarises your work so that you don’t feel so scared when people come to your poster. I think that the Student Science Showcase is a nice platform for learning these skills – you are in an environment where it’s okay to make mistakes. What can we expect from this year’s Showcase? We have tried to plan the food around the theme of the keynote talk (given by Professor Ian Rowland from University of Reading). It will be buffet-style with a Mediterranean feel to it. 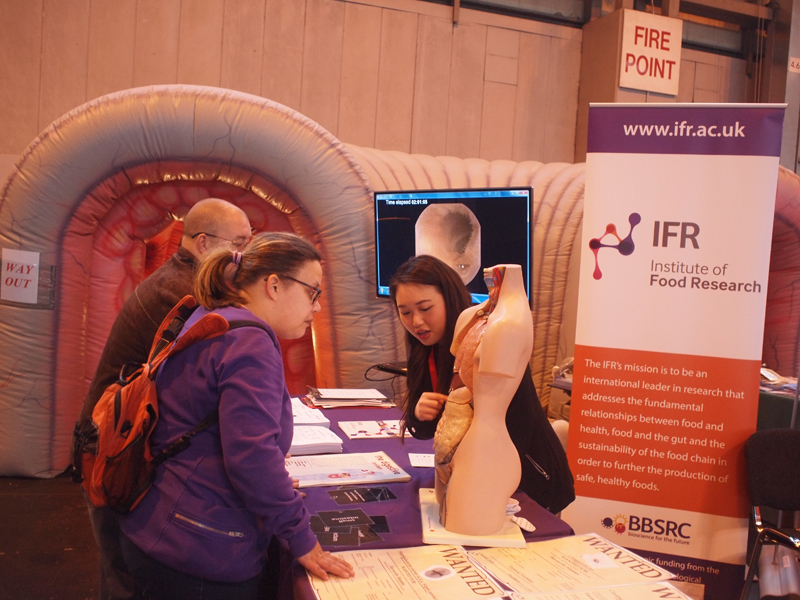 This year, we have managed to obtain a large amount of sponsorship from companies such as Biolabs, Primerdesign and Fisher, in addition to the funding given by the BBSRC, so expect some nice food and generous prizes! The sponsors will be there on the day to give us information about the services they offer, so feel free to have a chat with them. 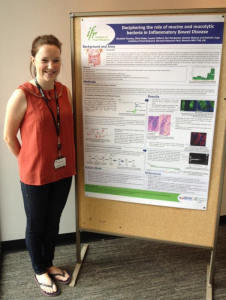 Speaking of prizes… you won one of the coveted poster prizes last year, well done! Do you have any top tips for designing a winning poster? Thank you! I would say that having a logical layout is quite important. Include lots of pretty pictures and don’t make it too wordy. Don’t forget an acknowledgements section! One useful tip is to print out a copy of your poster on A4 and try to read it – if you can’t read the writing then it won’t be readable on the real thing either. And finally, what advice would you give to the current first years who will be taking part for the first time? Don’t worry about how far you have got in your project or how big/small your results section is. Anyone can present a good poster, even if it only contains background information about your project. 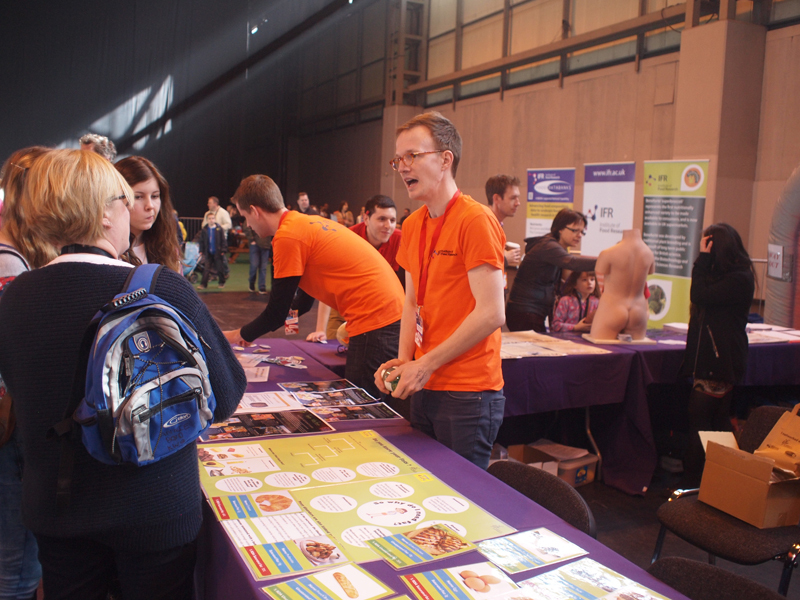 Concentrate on enjoying your first experience of presenting a poster and try to speak to as many people as possible. If people are not noticing you, approach them! I wish that I had spoken to more people last year and had not let nerves get in the way. 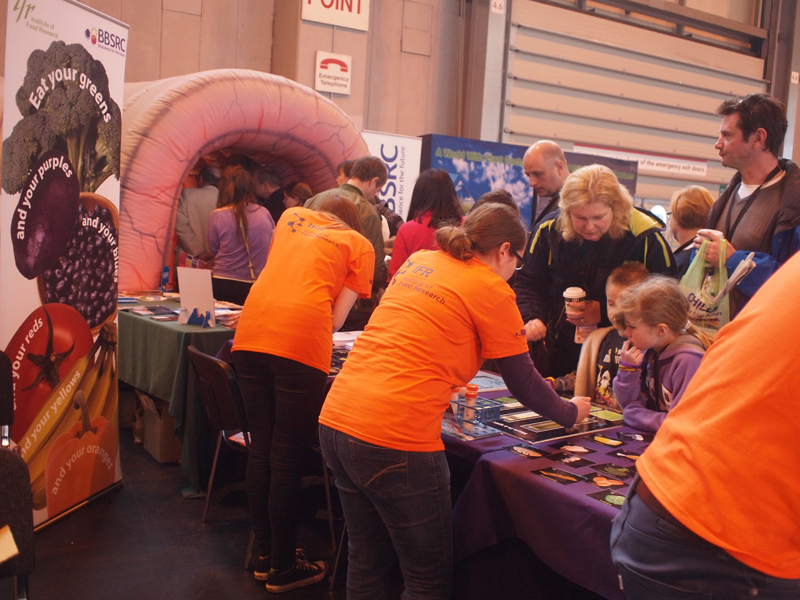 Once you get going, you will feel much more comfortable chatting to people about your work. Enjoy it! 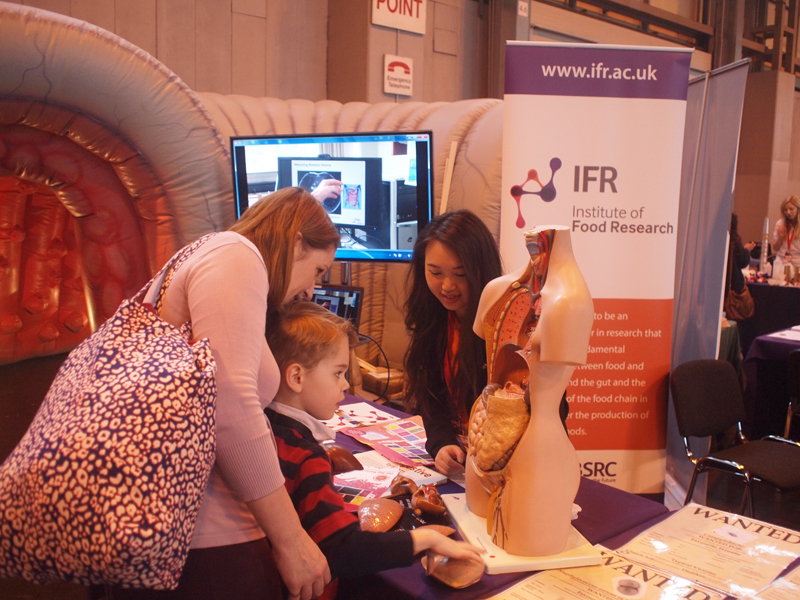 The IFR Student Science Showcase 2014 takes place on Monday 23rd June from 2pm in the IFR lecture theatre. By Steven Lewis, a 3rd year PhD student in Stephanie Schueller’s lab. 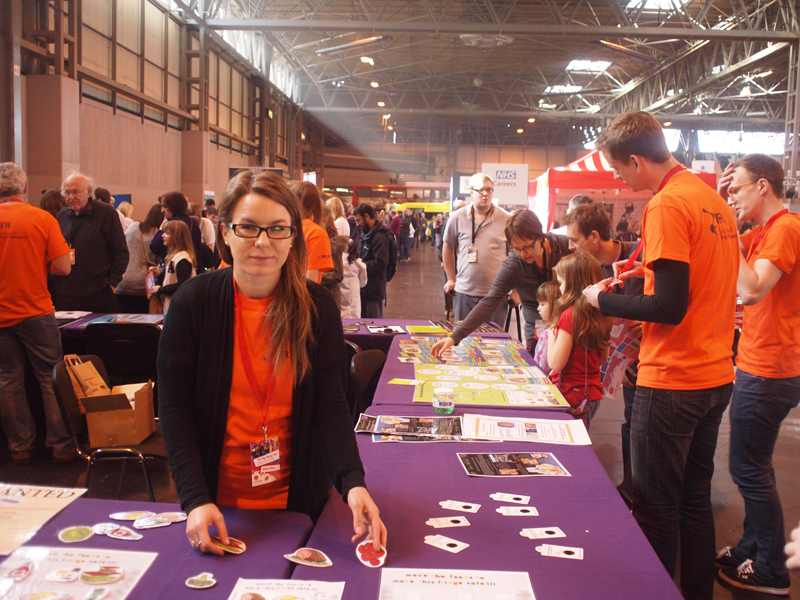 The Big Bang is the largest celebration of science, technology, engineering and maths for young people in the UK. 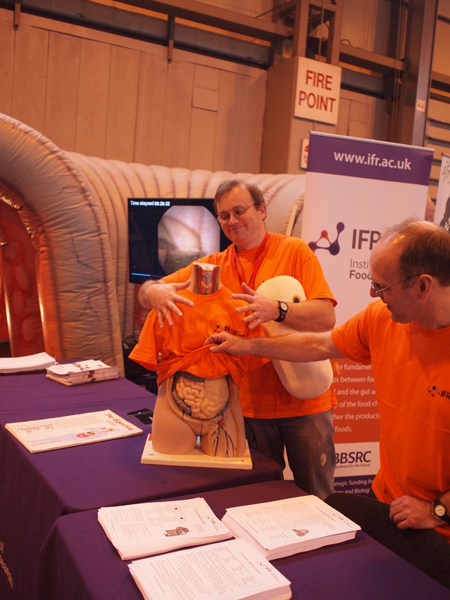 This year it was taking in place in Birmingham and the IFR had a stand presenting the work being done at the Institute. 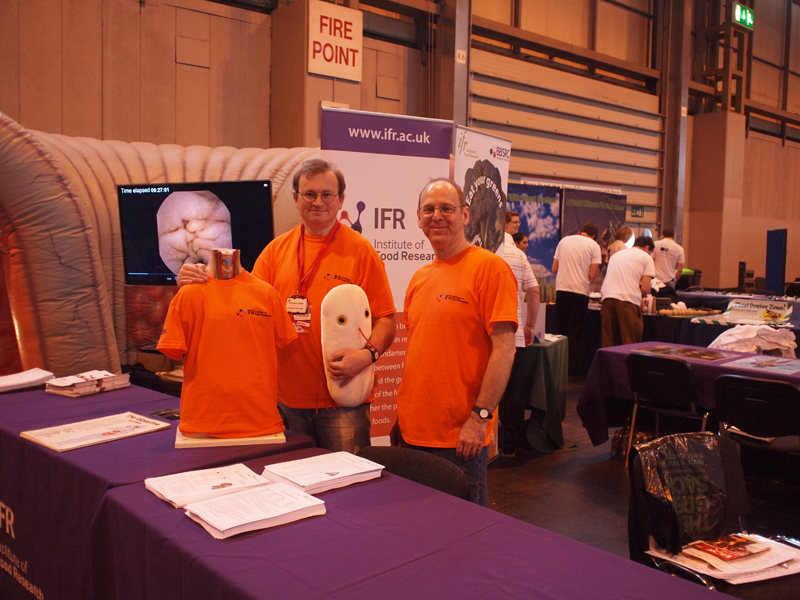 A large number of students and members of the IFR travelled up North to show and explain to the hundreds of students, children, parents and teachers their science and answer questions. 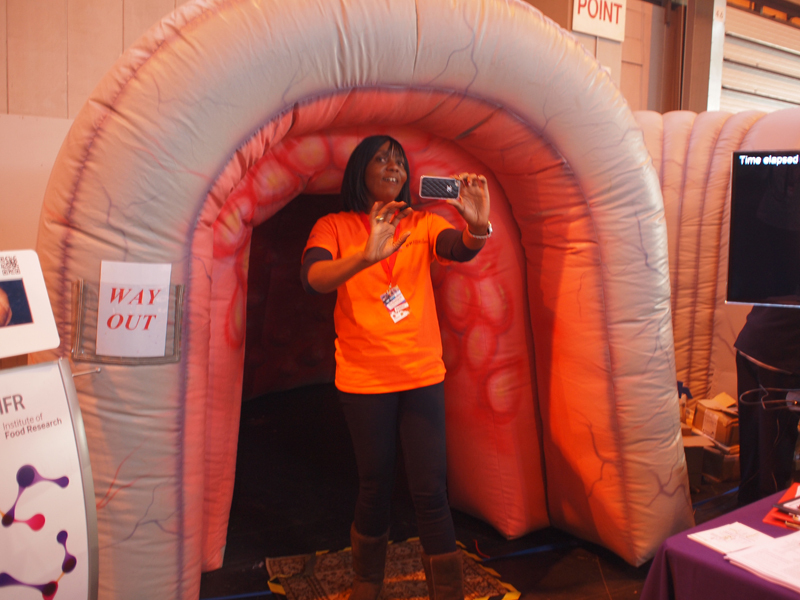 Have a look at the pictures below to see how much fun we had and the awesome blow-up, walk-in colon.